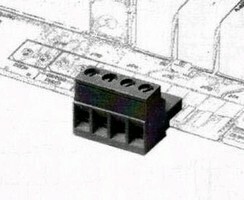 Power Distribution Terminal Block suits panel applications. Terminal Connectors save PC board space. 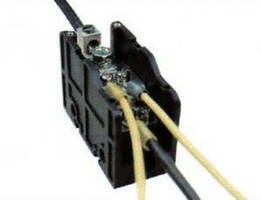 Terminal Blocks feature low profile and angled wire entry. Modular Terminal Blocks feature multi-level design. With up to 4 staggered levels of poles, PSQ Series offers maximum accessibility for all connection points. 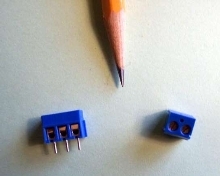 Units are available with 2-12 poles, in 5 and 10 mm pole pitches and accept wire sizes up to 11 AWG. Wire connections utilize M3 screws made of nickel-plated copper alloy. Rated for 300 V at 32 A, terminal blocks have PA6-6 polyamide housing and are CE, UL, CSA, VDE, and IMQ approved. 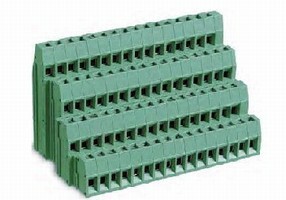 Terminal Blocks feature snap-on plastic safety covers. 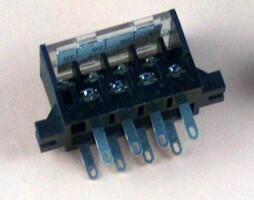 Pass-Through Terminal Blocks handle currents to 130 A.
Plug and Header Terminal Blocks feature 3.5 mm pin pitch. 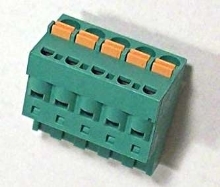 Snap Cover Terminal Blocks promote electrical safety. Terminal Blocks feature spring loaded connections. 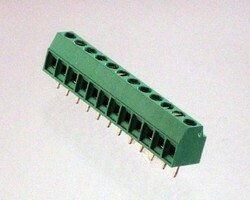 Miniature Terminal Blocks include wire guard feature.